Anarchy reigned in parts of Bangkok this morning following the Thai military’s pre-dawn raid on anti-government protesters who had blockaded parts of the city. />Thai soldiers in full combat kit used tear gas and fired automatic weapons to clear the red-shirt protesters from the Din Daeng intersection near the Victory Monument in central Bangkok, injuring at least 70 people. Nineteen people were admitted to hospital, four – including two soldiers and two civilians – had gunshot wounds. />BP: Abhist on BBC states he has checked with all the hospitals and “no confirmation of any deaths”. States they can protest peacefully. Says they twice tried to kill him last week. We are not going to allow violence and intimidation. />BBC has a breaking news story which states that the government has said that there was a recent government battle between local residents and protesters with one person dying. />BP: Actually, no one has even expected a response from the Palace… There is little mention of the Palace. Thaksin, who fled Thailand last year while facing trial on corruption charges, told CNN Monday he is willing to return home but did not say when. />BP: Will also some more commentary later. The commentary from the Thai media versus the foreign media is quite different. The Thai media no longer appears to be reporting what UDD states directly. />A former student leader during violently crushed demonstrations back in 1992, Jatuporn is also calling for the resignation of Prem Tinsulanonda, a close advisor to Thailand’s revered King Bhumibol Adulyadej. Thaksin and Jatuporn allege that Prem was the instigator of the 2006 coup that unseated Thaksin, a charge Prem denies. Thailand’s King does not normally comment on political matters, and he has made no public statement about the recent crisis. />Back at Red Shirt central, a pair of Buddhist monks calmly ate rice and curry, as angry protesters milled around them, brandishing photographs they said proved that soldiers had fired directly at the Red Shirts. “I came not to protest but to cheer up people who are fighting for justice,” said Pramaha Chartree, from the Sotorn temple. Last summer, at nearly the very same place, other monks said almost the same thing — but in support of the Yellow Shirt crowds who had camped out in front of Government House. When even monks find their loyalties divided, there promises to be no easy karmic fix for this predominantly Buddhist kingdom. />the more difficult one now. />BP: The economic cost is going to be high. />Various photos from both sides (more on government violence against the red shirts) at Pantip. What, indeed? Newin has no government role and his own fiefdom, Khorat, is 300km inland of the resort town which was to have hosted the weekend summit. Newin, also spotted on Friday night deep in conversation with Deputy Prime Minister Suthep Thaugsuban, says he was on hand to act as negotiator, if possible, with the red-shirted mob that overran the summit. />He is a remarkably flexible man, but peacemaking has not until now been one of Newin’s noted attributes. />BP: The blog gets a mention. Thai PBS reports 94 people injured from the government’s crackdown on the protesters. The doctors confirm there is no dead victim. The patients are sent to five hospitals including Rama, Phra Mongkut and Rajviti. />The station interviewed a doctor who is in charge and the report says 24 people are in serious conditions. The majority of injured people have gone home. The Red Shirts had burned two buses and tried to push over a telephone pole. Soldiers were out there as well – a double row of riot control soldiers with shields and batons, backed up by armed soldiers. The Red Shirts, numbering about 150, were on the road and on a pedestrian overpass, facing the soldiers. The road was littered with glass from broken bottles obviously used as petrol bombs. Speeches were being made from a sound truck. />I hear there is a confrontation at Yaowarat ongoing now. Clearly there are several spots around the city where similar confrontations are taking place. The army is bringing additional troops into the city. />Government spokesman professor Panitan Wattanayagorn told me on the phone that the army has “strict instructions not to shoot AT protestors.” While the first incident at Din Daeng in the early morning may not have been on those lines, the second pitched battle in the area did show the soldiers firing into the air as I blogged earlier. />Travel advisories for multiple countries have been updated in regards travel to Thailand/Bangkok/Pattaya. />7:15pm BBC has video of red shirts commandering buses and driving them into a bridge, troops shooting (ground level) into an alley. It shows the red shirts throwing petrol bombs (seem to be bottles of Chang beer) and using slingshots at the army. />”I mean a peaceful revolution”. They come with bare hands. The democracy we have now is not for the real people. It is by the elite and a few people of the elite. Interviewer responds they don’t come with bare hands. Thaksin [ignores the questions] states that the army is using M16s. He says they may have sticks and stones, but not weapons. Interviewer asks are you funding or directing them. Thaksin responds by stating he is not giving them money. He says he can’t direct them. They have pure democracy in their heart. [after being asked about his accusations on Prem] I don’t think HM is behind the coup. Patients in hospital, residents of a densely-occupied low-income housing estate, patrons of a upscale shopping mall, and the ruling Democrat party headquarters were all at risk at midday Monday as increasingly violent anti-government protesters fielded fully-loaded liquefied petroleum gas (LPG) tanker trucks for possible use as mobile bombs. />As fighting continues between government security forces and red-shirt activists from the UDD for control of Bangkok’s main traffic arteries at Din Daeng intersection, firefighting personnel throughout the capital are on full alert following the red-clad activists seizure of at least three LPG tanker trucks, parking one at Democrat Party headquarters beside Vichaiyuth Hospital, one at a government housing estate and the other at the King Power Shopping Complex. />At Din Daeng intersection, gunshots were heard at noon as military and police continued to move against red-shirted protesters. A suspected red-shirt guard was arrested and protesters ran towards Rajaparop intersection while the army regained the Din Daeng intersection. />Bangkok Disaster Prevention and Mitigation chief Niyom Karnasuta said Bangkok Metropolitan Administration (BMA) permanent secretary Pongsak Semsan had ordered the BMS’s firefighting fleet on standby as red-clad United Front for Democracy against Dictatorship (UDD) threaten to open a gas cylinder’s valve. />Residents of Din Daeng flats were alarmed earlier when UDD protesters drove a second LPG truck into their compound. />Protesters ordered residents to evacuate their homes immediately, with residents believing that the protesters would explode the gas tank. />BP: The mind boggles. Why would anyone be driving LPG in any area near protesters? The soldiers fired hundreds of rounds from their M-16 automatic rifles as they advanced, though it was unclear whether they were firing at, or over, the protesters,” the agency says. />A Bangkok hospital doctor told the BBC News website that 74 people had been brought into hospital, most of them suffering abrasions but some with gunshot wounds. 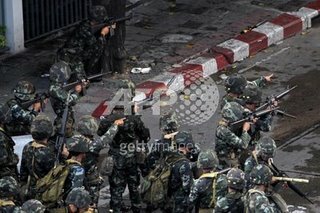 />An army spokesman, Col Sunsern Kaewkumnerd, said about 400 soldiers had moved against some 300 protesters. />He accused protesters of driving a car at the soldiers and said troops had first fired into the air in response to tear gas and smoke bombs thrown at them by protesters. />The soldiers then fired live rounds, he said. />”We will start with soft measures and proceed to harder ones,” the army spokesman told AFP news agency. />BP: Clearly wouldn’t tear gas be better than live ammo fired at protesters? It seems it is do nothing or fire directly at protesters. Thai soldiers sprayed automatic weapons fire into the air and threw tear gas to clear protesters blocking roads in the capital in the pre-dawn darkness Monday. Demonstrators responded by hurling at least one gasoline bomb and 70 people were reported injured, most by tear gas. />Around Victory Monument, a major traffic circle in the capital, the protesters retreated slightly after soldiers move in at midday. Nearby, a line of troops in full battle gear fired volleys of M-16 fire, most of it aimed above head-level, toward a group of protesters and turned water cannons on the crowd. />Some injuries were reported from incidents in the two areas, but an exact number was not immediately available by authorities. />Monday’s clashes marked a major escalation in the ongoing protests that have roiled this southeast Asian nation. The skirmish came a day after the country’s ousted prime minister called for a revolution. />Protesters controlled many streets in the capital where major department stores, malls and jewelry shops in Chinatown shut their doors. />A mob of the red-shirted protesters smashed cars carrying Prime Minister Abhisit Vejjajiva and his aides on Sunday. The secretary-general of Abhisit’s office, Niphon Promphan, was dragged from the car and beaten, suffering head injuries and broken ribs. />Abhisit appealed Monday to the demonstrators to return to their homes, saying the government was using “the softest measures possible” against them. />”All the work I am doing is not to create fear or put pressure or to harm any group of people. It’s a step by step process to restore order and stop violence,” he said on nationwide television. />”In the next few hours, several security measures will be established … to secure major ports, international airports and infrastructure,” he said. />Monday’s first clash began between 4 a.m. and 5 a.m., as troops in full combat gear advanced to disperse the protesters, who were occupying a major junction, according to witnesses. />The soldiers fired hundreds of rounds from their M-16 automatic rifles, with Associated Press reporters saying most appeared to have been aimed over the heads of the protesters. The reporters saw protesters throw at least one gasoline bomb which exploded behind the army line and tear gas floated across the eerie dawn scene. />At the nearby Century Park Hotel, foreign tourists were seen rushing into taxis and heading for Bangkok’s international airport. But others seemed unruffled. />”We’re from South Africa. We don’t scare easy,” said Estelle Jones, a tourist from Johannesburg. />Dr. Chatri Charoenchivakul of the Erawan Emergency Coordination Center said at least 70 people were injured, most of them from tear gas, while two soldiers and two civilians suffered from gunshot wounds. />Army spokesman Col. Sansern Kaewkamnerd said the protesters also used tear gas as well as “weapons” to open fire on the soldiers. />In another incident, the official Thai News Agency said three grenades, believed to be fired from an M-79 grenade launcher, landed inside the compound of the Constitutional Court. One exploded, causing minor damage, and the other two failed to explode, the report said. />BP: Live on BBC, Jonathan Head. About one hour and a half ago, there was gunfire both in the air and on the ground level. Jonathan says the army response was it was aimed “at their legs”. Says would be surprised if there were not a number of causalities. Volatile situation. Not clear on how it will end. />1:45pm To be honest, it is hard to know what exactly has happened. Both the government and the red shirts position on what has transpired differs. If you want a journalist’s live blog of events go here – alternatively if you just want an update on what happened, also go there! Soldiers shooting in the air and firing tear gas have cleared the first small group of red shirts from an area near the Victory Monument. Dozens of people were injured. />Troops began moving in to disperse red-shirt protesters at about 4 a.m. Monday morning in their attempt to open traffic at Din Daeng intersection which has been blocked since Sunday. />Army spokesman Col Sansern Kaewkamnerd said that troops first ordered the protesters to leave, but they answered with tear gas, gunshots and petrol bombs hurled from the expressway. />He added that a protester rammed a hijacked bus into the troops, injuring some. />In retaliation, the troops fired tear gas and their automatic rifles into the air as they moved in to break up the protesters. The troops managed to disperse the rowdy crowd and open part of the road to traffic half an hour later.